I am truly honored to have a guest post up today at Maia Duerr's site, the Liberated Life Project. Maia is doing a fascinating series about life-changing questions. I was humbled to be included among an amazing assortment of individuals offering a question that changed their life. (You can see that post here.) My guest post today is an expansion of that question. I would HIGHLY recommend checking out the other questions/answers on the original post...such fascinating perspectives! Please go HERE to read that post about a question that changed (and continues to change) my life. I also included with that post an art collage that arose while setting my intentions on the question. I'd highly recommend visiting the post at her site first (I'm really energized by the meaning of the post AND by Maia's exploration of life-changing questions!) then exploring below for more depth on the painting. I started this collage on a canvas-covered board that I had layers of previous attempts at a painting. Knowing I'd find some use for it, I hadn't yet discarded it. Thankfully. I applied torn strips of an old book (written in French) to various aspects of the painting. I did this while considering the logical background in which I was raised (which was heavily steeped in reading and the knowledge gained within). I hadn't intended on adding very much, but one strip led to two...which lead to two full pages of text adhered to the board. My logical side certainly wanted to claim its space. 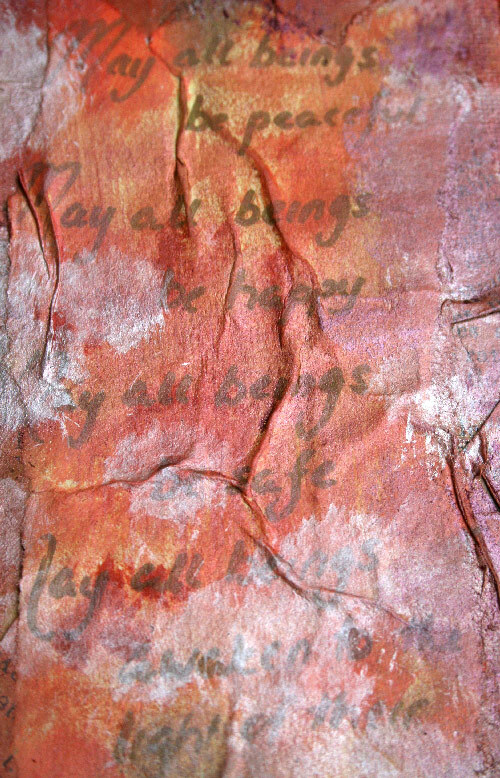 Other layers of paper were added (intentionally crinkled as the old text was...I wanted the "wabi sabi" or more imperfect look. "Wabi Sabi" is more of a "quiet, undeclared beauty that waits patiently to be discovered" (nobleharbor.com)). I also added a Buddhist Metta Blessing, which felt appropriate energy to add to the piece. Also added was a picture of Qwan-Yin (Avalokitesvara or Kuan Yin), the bodhisattva of compassion. Qwan-Yin resides in the center of the piece, quietly looking over a lotus flower gently painted towards the bottom. The entire process was fascinating as I allowed myself to create not only the painting, but my being. I truly felt more peaceful during, and once I had completed the piece. The final art is a true reflection of the kindness vs. correctness question I ask myself constantly, containing both the logical text of "righteousness" and the more ethereal, energetic components of kindness and compassion. I hope you will reflect on your own choices today, deciding when to be right, when to be kind, or perhaps, when to be both. I would love to hear your answers to "When is it better to be kind vs. right?" in the comments section!! (And be sure to visit Maia's wisdom-filled site at http://www.liberatedlifeproject.com).